You probably know the expression, “Will the last person to leave, please turn out the lights?” But have you ever wondered, what makes an employee the last to leave? If it’s not the obvious culprits such as too much work or an impending deadline, perhaps it’s because the workplace environment is such that putting in extra time doesn’t feel like work at all, and late hours don’t seem to matter too much either. If your company culture compels employees to want to do more, go the extra yard or hit the light switch on the way out at night, you are on to something. Engaged employees, or employees that are emotionally committed to their company and its success, are hugely impactful to the organization’s bottom line. 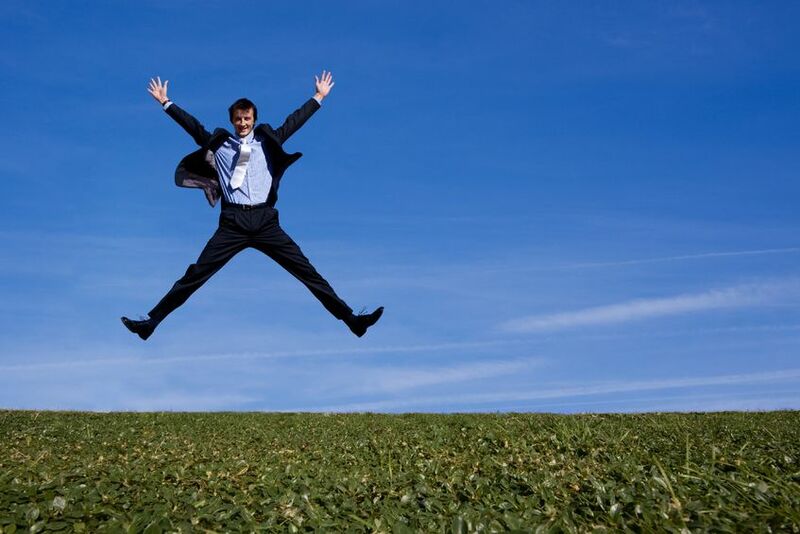 High levels of engagement can supercharge employee productivity and leave customers smiling. Not convinced? In How the Best Places to Work are Nailing Employee Engagement, Sylvia Vorhauser-Smith of PageUp People, describes how employees value “simple connections and involvement” as well as being part of a larger picture. An environment where people feel connected and in sync with the company culture encourages communication, dialogue and high levels of employee input. 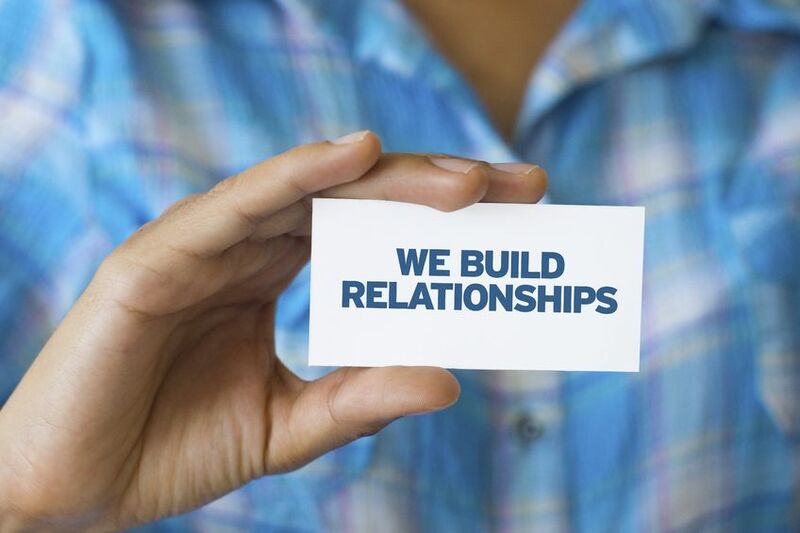 Not surprisingly, engaged employees thrive in part due to the connectivity and relationships that the workplace fosters. They bond with their colleagues while engaging in robust, challenging conversations. Connected employees often continue to spend time with their co-workers outside the workplace too, and all of these interactions strengthen their loyalty to the company. Engaged employees are less likely to leave and seek jobs elsewhere. In Engagement and Retention in 2013, TalentKeepers, an award-winning engagement solution company, found that engaged employees have decreased turnover relative to their disengaged peers. Retention also surfaced as a strategic priority for the vast majority of companies polled given the added expense of recruiting and hiring replacements. For managers to retain their best talent, the workplace must be a vibrant environment which compels employees to remain engaged in all aspects of their jobs. An annual Gallup employee engagement assessment of well over 1 million employees analyzes everything from customer ratings and employee absenteeism to safety incidents and worker productivity. 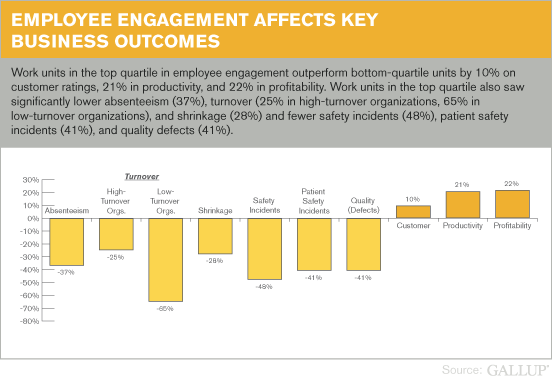 Work units with highly engaged employees outperformed similar units with disengaged employees in each of the 10 metrics chosen. For companies that can cultivate an environment of employee engagement, workers are more productive, customers are happier and the business is more profitable – not a bad set of outcomes. In an interesting Global Workforce Study by Towers Watson, it is clear that employee engagement levels impact the customer experience. Engaged employees are more energized and productive. Customers love a fabulous consumer experience as well as consistency in their interactions with company employees. However, higher levels of absenteeism and worker turnover are a direct result of employee disengagement. Larry Myler, CEO of By Monday, an employee engagement consulting firm, describes disengaged employees as “giving the smallest amount possible in order to get what they need.” The inclination to do less, not more, impacts absenteeism, worker turnover, the quality of the customer experience and invariably customer loyalty. Low levels of employee engagement can lead to negative perceptions of company management as well as a genuine lack of understanding by the employees as to the strategic direction for the company. In The 7 Hidden Reasons Employees Leave, author Leigh Branam explains, “Employees in too many companies look at their senior executives and see self-interested, short-term focused, ego-driven greed.” They disengage and stop supporting the management team. At worst, they even lose sight of the corporate mission. Without the support of its employees, management teams for growing companies will struggle to gain momentum, grow and innovate. So, if at the end of the workday, your employees rush for the exits, and you are left turning out the lights; it may be time to rethink your employee engagement strategy. There’s a lot at stake. The impact of high employee engagement pervades every aspect of the company culture, impacts the financial bottom line, and can catalyze customer loyalty. Employee engagement really does matter, and if it’s not on the top of your bucket list, there’s no time like the present to put it there.